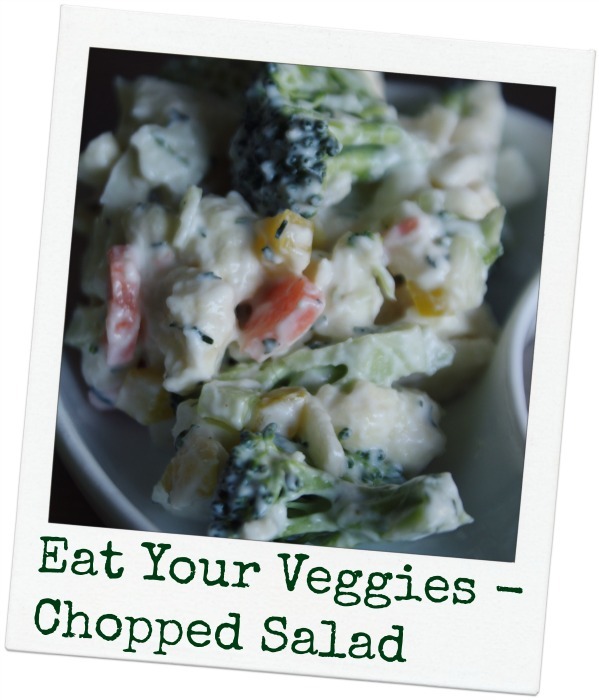 MamaEatsClean: Easy Way to eat your veggies - Chopped Salad! Wow, I feel really good today. My iron deficiency seems to be behind me for now. My stomach is a little bit off but I think it is slowly adjusting to the iron pills. I went to the gym this morning and felt incredible. I had so much energy - I felt almost high so was probably a bit annoying. Baby also slept in his own bed for the entire night for the first time ever (yes - he is 8 1/2 months old) and I only fed him 3 times (one was a dream feed so that doesn't really count as a wake up). Sounds pathetic but it was wonderful to me because he has been getting up every two hours for the past, well, since he's been born. Amazing what some B12 shots, iron pills and sleep can do for a person. I love feeling this energetic - I just want it to last - please let it last. If you don't feel good try to figure out why - don't just accept it. I wish I wouldn't have done that for so long. So I'm going to keep clean and eat my veggies...............and hope it sticks. If you are like me and eat a lot of salads for lunch you might not want another "lettuce" salad for supper. But filling up a dinner plate (and a hungry belly) when you don't eat grains, white potato's or rice can be a challenge. So this is a great alternative salad you can easily make with whatever veggies you have in the fridge. It can be made ahead of time or you can do all your chopping the night before so its a great recipe for all you busy ladies and gents that need to get dinner on the table quick. I still haven't learned to make mayo so I used bottled miracle whip - bad, I know but I have to pick my battles. I can't do everything from scratch. I had some jicama in the fridge and it went really well in this salad - the sweet crunch is awesome. If you don't have jicama you might want to try apple instead, or even grapes. Chop all your veggies and mix together in a bowl. In a separate bowl mix together all of the dressing ingredients. Combine veggies and dressing about 1/2 hour before serving. Voila - easy chopped salad. Bannerizer made it easy for you to promote ClickBank products with banners, simply visit Bannerizer, and grab the banner codes for your favorite ClickBank products or use the Universal ClickBank Banner Rotator Tool to promote all of the ClickBank products.